The technology involved in lubrication by nanoparticles is a rapidly developing scientific area and one that has been watched with interest for the past ten years. Nanolubrication offers a solution to many problems associated with traditional lubricants that contain sulphur and phosphorus; and though for some time the production of nanoparticles was restricted by the technologies available, today synthesis methods have been improved to such a level that it is possible to produce large quantities relatively cheaply and efficiently. 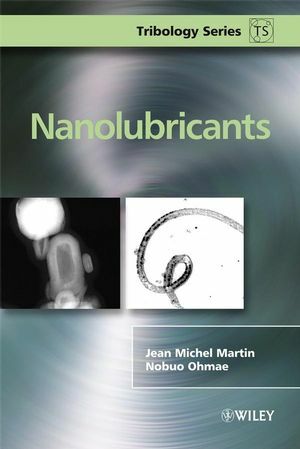 Nanolubricants develops a new concept of lubrication, based on these nanoparticles, and along with the authors’ own research it synthesises the information available on the topic of nanolubrication from existing literature and presents it in a concise form. Describes the many advantages and potential applications of nanotechnology in the tribological field. Offers a full review of the state-of-the-art as well as much original research that is yet unpublished. Includes sections on boundary lubrication by colloïdal systems, nanolubricants made of metal dichalcogenides, carbon-based nanolubricants, overbased detergent salts, nanolubricants made of metals and boron-based solid nanolubricants and lubrication additives. Authored by highly regarded experts in the field with contributions from leading international academics. Nanolubricants will appeal to postgraduate students, academics and researchers in mechanical engineering, chemical engineering and materials science. It should also be of interest to practising engineers with petroleum companies and mechanical manufacturers. Jean Michel Martin is a professor at the Ecole Centrale de Lyon in France where he served for 5 years as director of the materials science department. He has authored 130 journal papers and 4 book chapters. Nobuo Ohmae is a professor at Kobo University in Japan, where he has served as head of department of mechanical engineering and chaired the International Tribology Conference in 2005. He has authored 135 journal articles and 10 book chapters. 1 Colloidal Lubrication (Jean Michel Martin and Nobuo Ohmae). 1.1 Stability of Colloids Dispersed in a Base Oil. 1.2 Lubrication by Micellar Systems. 1.3 Lubrication by Metallic Nanoparticles. 1.4 Colloids Embedded in a Coating. 2 Nanoparticles Made of Metal Dichalcogenides (Lucile Joly-Pottuz and Fabrice Dassenoy). 2.1 Tribological Properties of 2H-MoS2. 2.2 IF-MoS2 and IF-WS2 Fullerene-like Nanoparticles. 2.3 IF-MoS2 and IF-WS2 as Additives in Boundary Lubrication. 2.4 NT-MoS2 and NT-WS2 Nanotubes as Lubricant Additives. 2.5 Lubrication by a Mixture of Fullerenes. 2.6 Tribological Properties of Mo-S-I Nanowires. 2.6.1 Influence of the Nanowire Concentration in PAO on the Tribological Properties. 2.7 Raman Tribometry on IF-MS2. 2.7.1 In situ Observation of the Structures in the Interface. 2.8 Lubrication Mechanism of IF-MS2: ‘A Drug Delivery’ Model. 3 Carbon-Based Nanolubricants (Lucile Joly-Pottuz and Nobuo Ohmae). 3.1 Graphite Onion Synthesis and Characterization. 3.2 Tribological Properties of Different Carbon Onions. 3.3 Possible Lubrication Mechanism of Carbon Onions. 3.4 Nanotube Synthesis and Characterization. 3.5 Friction-Reducing and Antiwear Properties of Different Nanotubes. 3.6 Possible Mechanism of Action of the Nanotubes. 4 Reverse Micelles and Encapsulated Nanoparticle Approaches (Jean Louis Mansot and Jean Michel Martin). 4.2 Overview of the Structures of Stoichiometric and Overbased Soap Additives. 4.2.3 Encapsulated Nano-Sized Particles, also Called ‘Overbased Reverse Micelles’. 4.3 Behaviour of the Micelles at the Solid–Liquid Interface. 4.4 Tribologic Properties of Colloidal Systems. 4.4.1 Friction Reduction Properties of Micelles Related to Their Structure. 4.4.2 Antiwear Action Mechanisms of Colloidal Systems. 4.4.3 Nature and Structure of Antiwear Films Obtained with Strontium and Calcium Compounds. 4.4.4 Associated Antifriction and Antiwear Actions in Tribological Behaviour of Colloidal additives. 5 Nanolubricants Made of Metals (Weimin Liu and Xiaobo Wang). 5.2 Nanolubricants Made of Coinage Metal Nanoparticles. 5.2.1 Organic Compound Surface-Capped Copper Nanoparticles as Oil Additives. 5.2.2 Copper Nanoparticles Passivated by Carbon Film Used as Oil Additives. 5.3 Nanolubricants Made of Low Melting Point Metal Nanoparticles. 5.3.1 Nanolubricants of Indium, Tin and Bismuth via the Direct Solution-Dispersing Method. 5.3.2 Nanolubricants of Lead and Bismuth via the Surfactant-Assisted Solution-Dispersing Method. 5.4 Nanolubricants Made of Low Melting Point Metal Alloy Nanoparticles. 5.4.1 In-Sn, Bi-In and Pb-Bi Nanoparticles Prepared by the Direct Solution-Dispersing Method. 5.4.2 Sn-Bi and Sn-Cd Alloy Nanoparticles Prepared by the Ultrasonic-Assistant Solution-Dispersing Method. 5.5 Mechanism of Metal Nanoparticles Used as Oil Additives. 6 Boron-Based Solid Nanolubricants and Lubrication Additives (Ali Erdemir). 6.1.1 Brief Overview of Lubrication Mechanisms of Solid Lubricants. 6.1.2 Recent Advances in Solid Lubrication. 6.2 Brief Overview of Boron and Its Self-Lubricating Compounds. 6.3 Lubrication by Colloidal Boric Acid Nanoparticles and Other Boron Compounds. 6.3.1 Preparation of Oils with Nano-Boric Acid Powders. 6.3.2 Lubrication Performance of Various Oils Containing Nano-boric Acid Particles. 6.4 Lubrication Mechanism of Nano-Boric Acid Colloids in Oils. Appendix Tribometers Used for the Studies of Chapters 2 and 3.